Originally spotted by Muzik Magazine through their famous Bedroom Bedlam competition –Yousef has been smashing dance floors every since. Yousef soon became a regular at both MoS’ Move (Friday) and Rulin (Saturday) nights - proving to all his versatility of style. He also became a regular at Renaissance at Media and in the beginning of 2000 gained a much sought after residency at Cream on the Annexe - providing an antidote of US / UK house music - to the main room of trance. Since, Yousef won Best Bedroom Bedlam DJ @ the 1999 Muzik Awards, has DJed in front of 20,000 at Creamfields, England, smashed Space and Pacha in Ibiza. He was crowned as one of the stars of the 2000 series of Hot Mixes for Pete Tong – one of only four DJs to do so. 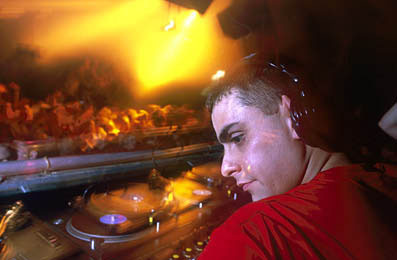 DJed for Creamfield’s Ireland and the Gatecrasher Soundsystem 2001, played on the Amnesia Terrace for Cream in Ibiza and following the success of his performance live on Radio 1 from Southport, was asked to stand in on Seb Fontaine’s weekly Saturday evening show - which Yousef did to a huge success. Meanwhile his first mix compilation CD was released to great acclaim and he amazingly found the time to turn his hand to the studio as he teamed up with Basics resident Paul Woolford producing music under the alias 10,000 BC with their first remix making it onto Danny Rampling's show. The duo have since released remixes for Aphrohead, Meeker, Stella Brown, Chocolate Puma, Hubert Hudson and Rainstar, not to mention work on Felix Da Housecat's single still in the pipeline and plans for the release of the first 10,000 BC EP. With Steve Mac from Rhythm Masters, Yousef has also recorded under the moniker "Drum Bums". The most recent addition to Yousef's resume is his winning the Best Breakthrough DJ award at 2001's Muzik Awards. It was at this ceremony where Radio 1 officially announced that he is to be a resident DJ for 2002.